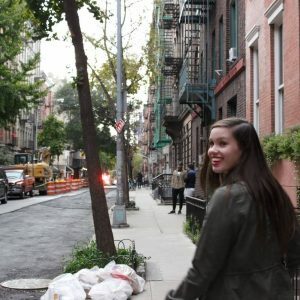 Sarah is thrilled to be interning at The Facing Project this summer! She was born and raised in Muncie and graduated from Muncie Central High School in 2015. She is a rising junior at Wesleyan University in Middletown, Connecticut, where she studies Government with a focus in Comparative Politics and is also pursuing a certificate in Civic Engagement. This fall, she will be studying abroad in Durban, South Africa, learning about economic, social, and political transformation in the post-apartheid era. Sarah hopes to pursue a career in the nonprofit sector, hopefully with an organization that works to increase girls’ access to services such as healthcare and education in developing countries. She is also passionate about theatre, journalism, politics, public education, and prison reform, among other things. In her free time, Sarah likes to act, read, write, travel, and sing and dance around the house to showtunes. She loves The Facing Project’s model of connecting people through storytelling and exposing communities to the different circumstances and narratives of the people living in them, and she is very excited to see what spending the summer working with them will bring!